Congratulations to the Startup Weekend Atlanta crew. I was only there for part of Friday night, but I’ve been following the action (and the drama) on the Startup Weekend blog. Anyone who can endure an entire weekend of wall-to-wall effort with a sizable crew of people they largely don’t know deserves some serious praise. They launched Skribit late last night, and TechCrunch picked it up shortly after. I think Mike got it right — the emphasis here shouldn’t necessarily be on the application they built, but on the ability of an ad-hoc team to get together on a Friday night, come together to choose a project, and do it. I’m very impressed with the number of people who saw it through. Huge thanks to Lance Weatherby for bringing an SW to Atlanta and pulling it all together, and to founder, organizer, and facilitator/emcee Andrew Hyde. It was a pleasure meeting Andrew and I look forward to following his work. I haven’t made my way through the participants’ write-ups yet, but I did read Micah’s piece about why he left on Saturday. Micah’s main point was that 30-60 people is a lot of cooks, especially when there are no agreed-upon processes ahead of time and no comfort level already established. I sensed the same thing on Friday night. It simply felt too chaotic for me with that many people bound by so few shared assumptions. That said, it looks like it worked out well for those who stayed. In the end they developed enough rapport and shared structure together to make it through. It just may not be the right environment for me. As it was, Friday being my last day at EarthLink I needed the weekend for some important personal time, so I might have felt differently if I had come in in a different mood and mindset. I feel that I forfeited my right to complain too hard about the idea chosen because I didn’t stick around through the voting. And I fully support the efforts of my friends, colleagues and new acquaintences. But I do have a few comments. I’m not sure I see the well-defined need for the idea they chose — wondering what my readers want me to write about is just not a friction point I feel and doesn’t fit with my vision of blogging. I have comments, and an available email address, and beyond that my readers have their own blogs on which they can write whatever they want. When I wanted Lance to write about Paul Graham’s Valleycentric comments, I emailed him about it, and that worked fine. My readers are individuals, and I like to hear from them individually. It’s artificial to me to think I need a widget to take requests, and widget space is precious these days. But maybe if you have the problem of too many readers and comments, this becomes a real issue for you, and in that sense it’s more like a productivity tool. I would have liked to see the group tackle a real need or a small piece of a big problem. We have a tremendous water shortage in Atlanta right now, but most people in the room didn’t seem to interested in doing something in that arena. I don’t know much about what Skribit became, only what the idea was at pitch-time and during the prior discussions at BarCamp Atlanta. It’s a fine kind of idea to execute in a weekend. It’s a bite-sized piece of functionality, and that’s probably what’s most important for this all as an exercise. I’ll be taking a closer look with an open mind and reserve the right to do a 180 on it if I’m getting this wrong. 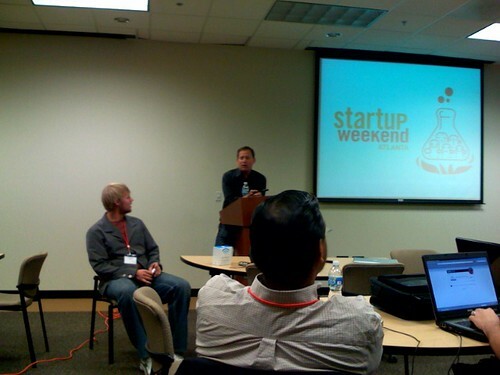 I agree, a local focus would have been an ideal (and innovative) use for Startup Weekend. I wish more people would focus locally w/ stuff like this.